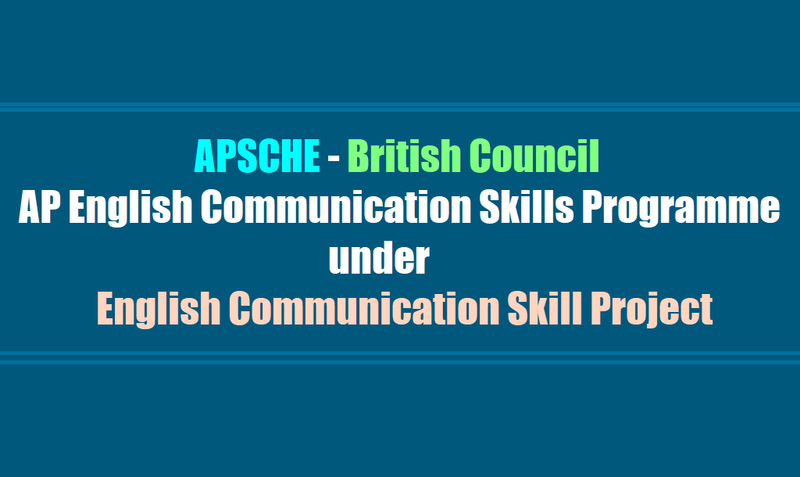 Students can join the AP English Communication Skills Programme 2017 by APSCHE - British Council/ Enrollment of students to join the training course on English language: The British Council and the AP Higher Education Council are inviting the students with registrations from to join the AP English Communication Skills Programme under APSCHE-British Council English Communication Skill Project. The British Council will be trained in the English language to train over lakhs of students across the state for skills in English and Communication. The higher education council suggested that student can register at the website http://www.apenglishskills.in/. The British Council has recommended a student registration fee of Rs.360 for the training certificate. As many as 184 colleges in the state have already completed training for 1700 teachers to train the English language skills. APSCHE invites you to join an English and Employability Course 'Learn English Select' designed by the British Council, the world's English language expert. With this programme, you will develop English language skills and required proficiency to excel at your workplace. 1. Selected through a rigorous process. 2. Trained by CELTA qualified British Council trainers. 3. Employ learner-centred teaching methodology in their classes. 4. Use specific techniques for teaching speaking and writing in their classroom. 1. Teachers will be trained and mentored by Master Trainers. 2. Teachers will be able to employ learner-centred techniques and approaches in their classroom. 3. Pedagogy will be learner centred techniques and approaches in the classroom and will help in improving English ability of students. 4. Teachers and students will be given certificates from British Council and APSCHE after completion of the course. 3. Increase confidence: Speak with more confidence in English to large audiences at work and with customers. APEnglishSkills, AP English Skills, apenglishskills Application, APSCHE British Council, British Council English Communication Skills Project, Learn English Select Employability Course.